You know Bryant Park is always looking for ways to expand programming and events at the park. We've been working on a huge new addition to the lineup, to rival other signature events, like Square Dance and Musical Chairs. Introducing Winter Carnival, our brand new signature winter event at Bank of America Winter Village. 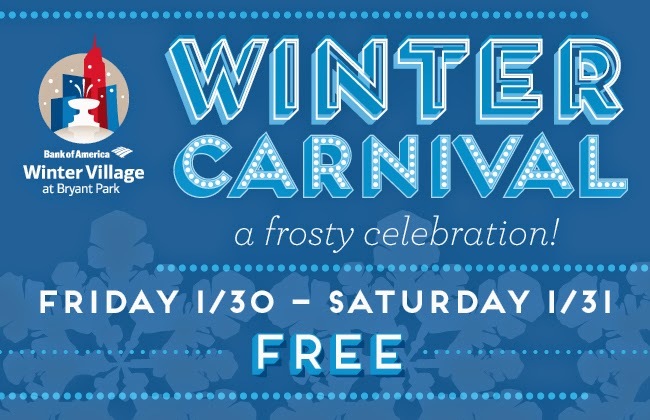 Slated for January 30 and 31, noon - 10pm on both Friday and Saturday, Winter Carnival will give you a reason to embrace the winter season. Each day is capped off by a feature event. On Friday the 30th, join us from 7pm to 10pm for a skate night with a surprising theme--the summer! That's right, we're bringing summer to the Rink. Summer attire (go wild and wear your bathing suit!) and accessories are encouraged at Summer Skate Night, and may even be rewarded. As always, rink admission is free; skate rentals are priced as normal. On Saturday the 31st, join us from 7pm to 10pm for a Silent Disco. Shake off the winter chill at this free outdoor dance party. Grab a pair of wireless headphones and tune into one of three DJs spinning sets in different styles. Better yet, bounce between DJs for a full sampling of the sets. Onlookers will wonder what the heck you're doing...because the music can only be heard through headphones! For the young at heart, there will be a Kids Silent Disco preceding the Silent Disco. Winter Carnival will offer two full days of activities, from noon to 10pm. On both days, we'll have food and drinks available for purchase to fuel your fun. In addition, we'll host curling lessons, hockey goal shoot-outs, and ice golf. You may even see a return of beloved summer activities, like ping pong (both open tables and a tournament). We're cooking up other great events to round out the schedule so check back here often.